Styling The Stars: Lost Treasures from the Twentieth Century Fox Archives, was an award winning coffee table book and is now available in a 6.5 x 9" soft cover size. I went on this passion project journey with Tom McLaren, who discovered, with me, hundreds of never before seen photographs in the 20th Century Fox archives. 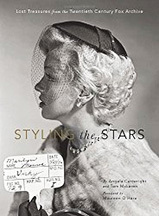 The photographs translate beautifully and this book makes a fantastic gift for anyone, including the movie star lover, the memorabilia and film buff, the stylist and the cconnoisseur of great photography.